Did your dentist tell you that you need a dental implant, but you’re not sure what a dental implant really is, or what a dental implant includes? Missing one or more of your teeth creates an imbalance in your smile, affects your ability to chew properly, and can change your eating habits, which leads many to become undernourished by eating the wrong foods just because they are easy to eat. If a tooth remains missing for too long, it can lead to bone loss in your jaw, which will further complicate the need to get dental implants. When you lose a tooth, your mandible begins to contract and becomes fragile from lack of function. When this happens, a bone graft is often necessary before an implant can be placed. Losing a tooth affects your smile. Losing several teeth can affect the proportions of your face causing you to appear older and unhealthy. Dental implants are effectively replacement teeth with dental screws introduced into the bone to provide extended reinforcement and support for crowns and dentures. Dental implants are the cutting-edge of tooth replacement. Most dental implants are virtually indistinguishable from natural teeth and are often much stronger. Today’s implants osseointegrate with your bone to give support for crowns and dentures. In other words, a dental implant will actually allow bone to grow through it, so that the implant becomes as strong as a regular tooth…perhaps stronger. In the USA and Canada, a dental implant can cost anywhere from $4000-$6000. This includes the implant post or screw, abutment and crown…depending on the materials. The cost for a complete dental implant with a high quality post, abutment and crown of porcelain, eMax or zirconia in Costa Rica’s leading clinics will cost $1500 to $2000. Less expensive options are available, but patients are cautioned to beware low quality materials. For patients traveling to Costa Rica from an international destination, we encourage you to seek a reliable provider with competitive rates. The best clinics will charge a little more. Purchase the best care you can afford. You will never regret the investment in high quality dental care. You Only Get One Smile…Keep It Looking Good! Dental Implants are light, strong, compatible with living tissue and are made from titanium, the safest material in dental and oral implants. Choose from individual dental implants, implant-supported fixed bridges, or implant-supported dentures! For more precise pricing, fill out the find a dentist form on this site. A dentist will contact you to discuss your need and more exact pricing for your procedures. The implant or fixture is the titanium screw like cylinder surgically inserted into bone that acts as an anchor for a crown to replace the missing tooth. Implant screws work like natural tooth roots. An implant takes between three to six months to integrate to bone. The average price of a dental implant in Costa Rica varies from $700.00 to $1000.00. The abutment is the part that passes through the gum into the mouth and is attached onto the dental implant fixture or screw. There are temporary abutments, prefabricated abutments (straight, angled), custom abutments (zirconia, titanium, various other metals; milled, and cast types); and abutments to use for overdenture attachments. 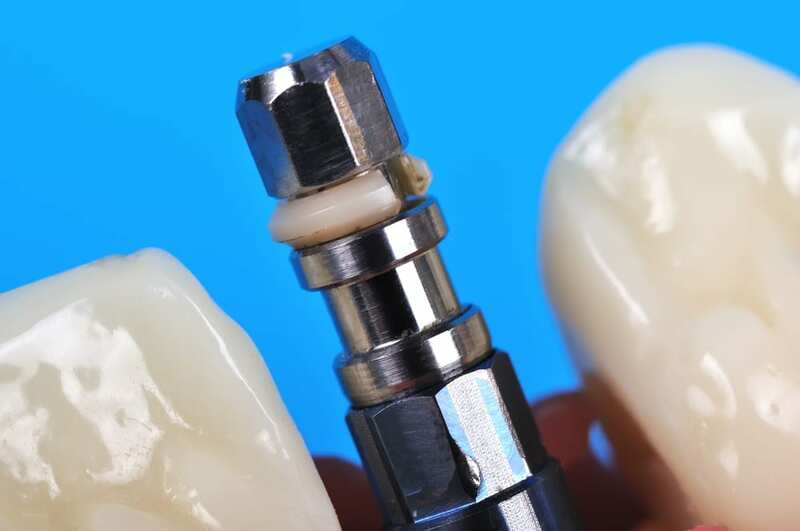 The cost of the abutment ranges from $200.00 to $300.00 in Costa Rica dental clinics. Dental implants are placed into the bone in a pain-free procedure. The bone and gums will be given time to heal before a crown are attached. In most cases, a temporary crown will be placed during the same appointment the implant is placed. An implant porcelain crown is often fused to precious metals, non-precious metals or zirconia. Prices range from $450.00 to $850.00 depending on the materials used. If all upper or lower teeth are missing, it is possible to place multiple dental implants to support a denture. Due to bone shrinking, traditional dentures become loose and unbalanced over time. Dental implant supported dentures maintain bone so they stabilize in your mouth. Depending on the materials used to manufacture your dentures (acrylic, ceramage, and porcelain) and the amount of implants placed (4 to 6), the prices will vary. In the USA, a full mouth restoration can cost $35,000-$60,000. In Costa Rica, high quality full mouth restorations can cost from $10,000 to $24,000. To learn more about pricing for dental implants in Costa Rica, please fill out the Find a Dentist Form on this site. A dentist will contact you to discuss your needs and pricing for your dental implants.